Occasionally we will get a call from a Customer or Designers who is trying to find a window treatment for a bathroom or a kitchen. Drapery is a tough option for either of these rooms but we specify Roman Shades for bathrooms and kitchens all of the time. As a matter of fact one of our more popular photographs is of a Roman Shade that we made for a bathroom. You can’t see it in the photo but just beneath the Shade is a large bathtub. Roman Shades provide a lot of versatility for odd sized windows or kitchens or bathrooms when a traditional curtain or drapery treatment is not practical. Very often we see Roman Shades in kitchens over the sink area, laundry rooms, pantries and mud rooms. They offer great privacy, especially when they are properly lined and interlined. We try to teach our Designers to think “outside the box” when it comes to custom window treatments for any room in your home. 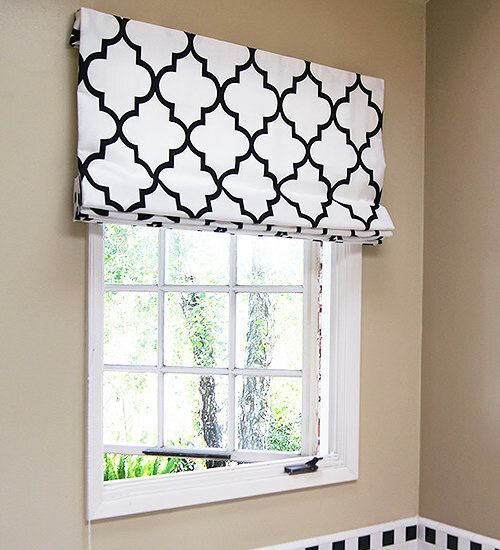 And, of course all of our Roman Shades are made right here in the USA in our custom workroom. 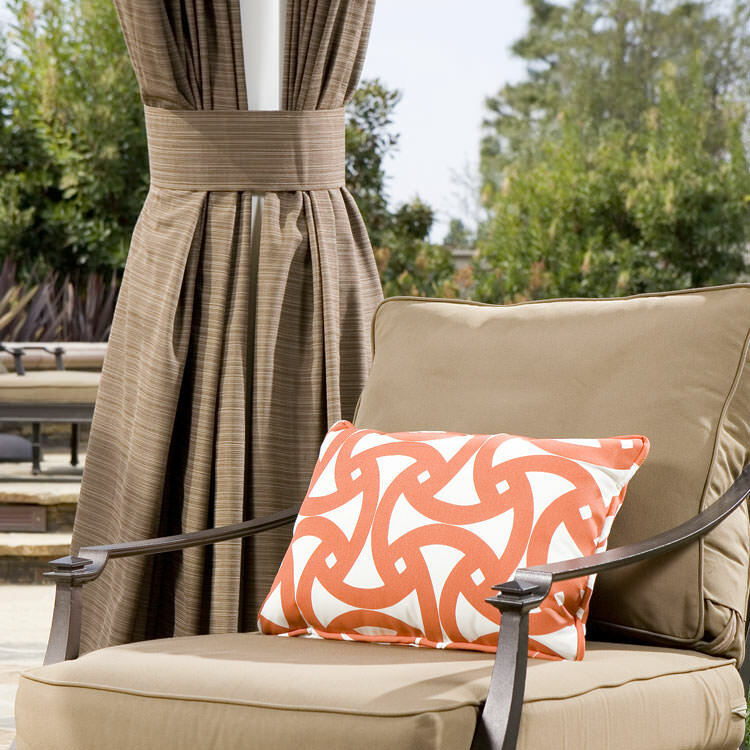 Time to Order Your Outdoor Drapery! I know – Seems crazy. It’s the end of February and half of the Country is enduring ice-cold temperatures. The weather report is “cold”, “colder” and even “coldest”. So, lets all change the conversation! Let’s start looking forward to spring! 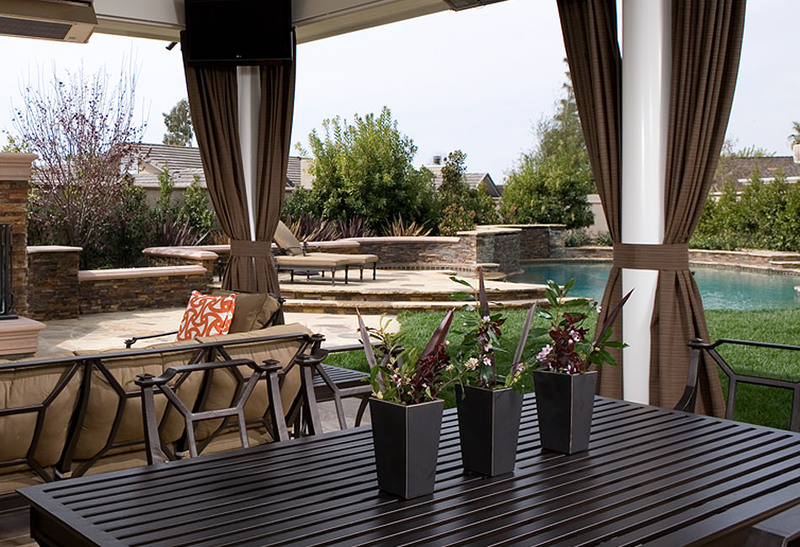 Believe it or not it will be here before you know it and now is the time to start getting your outdoor furnishings ready to enjoy every moment. Of course, we also have a full line of outdoor drapery hardware that is made to endure years of outdoor weather exposure and can also be customized to your exact specifications. Ask one of our Designers for help selecting the hardware components you will need as well. Please don’t be intimidated by the word “custom”. At DrapeStyle “Custom” does not mean “Expensive”. 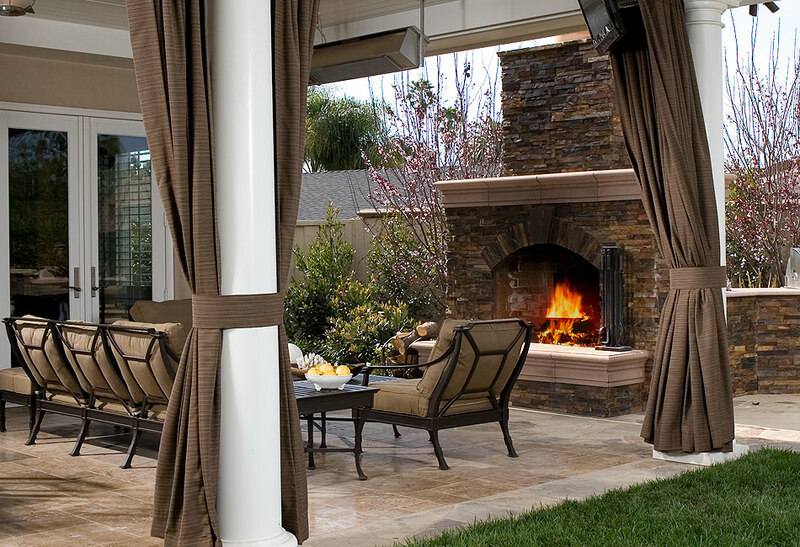 As a matter of fact, we can probably make you amazing custom outdoor drapery at pricing lower pricing than you will find at many larger retailers like Restoration Hardware or Ethan Allen! And, when you order from DrapeStyle, you are getting 100% American Made Custom at the exact size and fabric you need. We’ll need 4-6 weeks to make your custom outdoor drapes which means, if you order now, you should expect them to be delivered in mid-April. Order now and you’ll have one more thing to look forward too with Springs arrival!! Having Trouble Decising Between Silk Drapes or Linen Drapery? We get lots of Customers who just can’t make the decision between new custom silk drapery or linen drapes. Sometimes that answer they decide on is….”both”. Why not? Silk and Linen blend together like peanut butter and jelly. At DrapeStyle we’ve been combining silk and linen into unique drapery styles and designs for over a decade. We love the simple but elegant Silk Bordered Linen Drapery where we start with your choice of linen fabric and then add a contrasting silk border in your choice of Dupioni or Taffeta. We make each one panel to order in our workroom so we are not bound by the typical constraints of larger retailers. 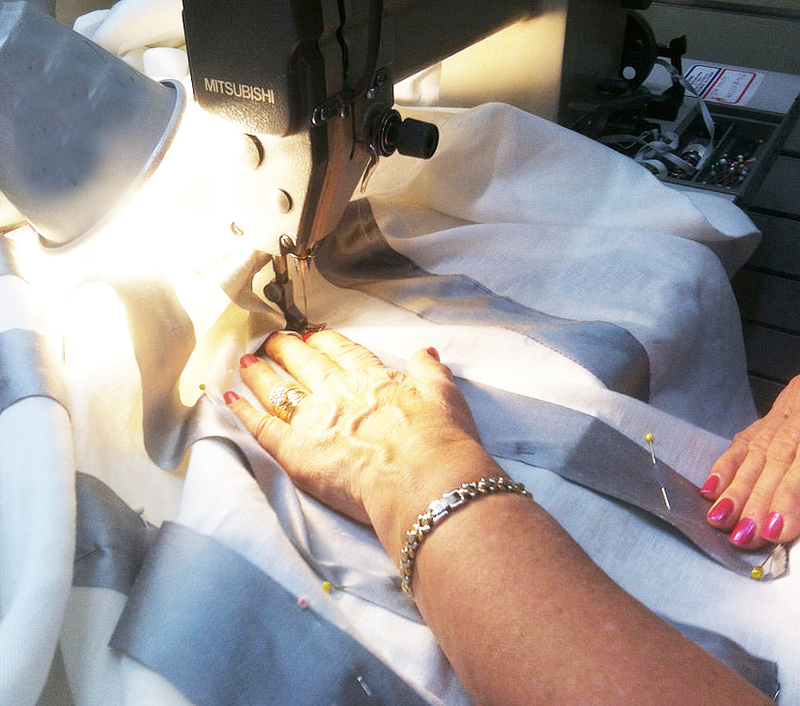 After all, every drapery and curtain panel we make at DrapeStyle is 100% custom. No ready made drapes here. Another best seller at DrapeStyle has been our Hotel Drape in linen. 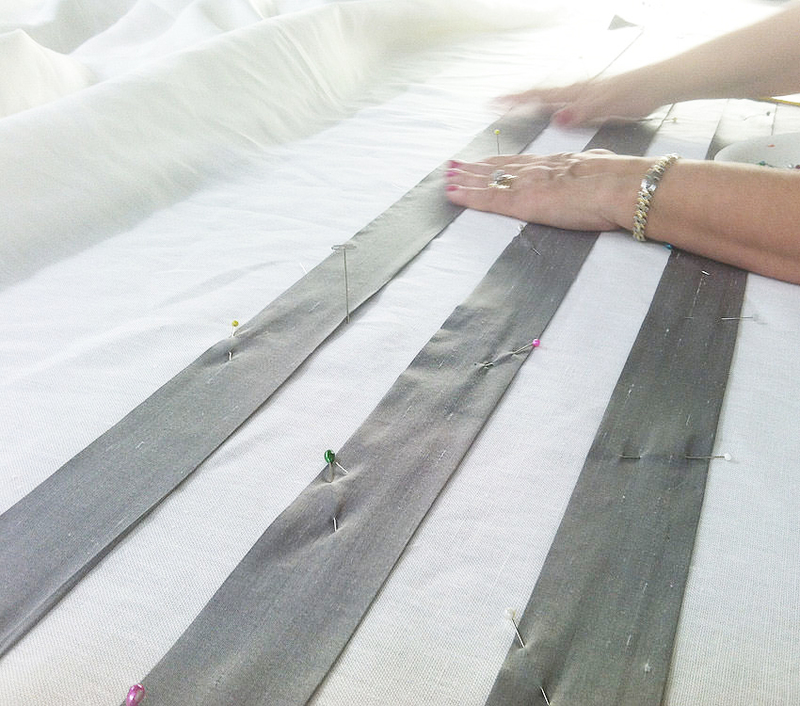 We start with your choice of any of our linen fabrics and then hand-apply four silk bands. These panels take a lot of time to make but we really think they’re worth it. If you need some help in choosing the perfect combination of fabrics please don’t hesitate to call one of our Designers who are standing by. Is Linen The Best Fabric for Custom Drapery? One of the most common questions were are asked when speaking to a Client about new custom made drapery is “what is the best fabric for my drapery?”. The simple answer is that it “depends”. Linen is, and has been becoming more and more popular for our Customers in the US and Canada. It seems like we’ve been seeing Linen Drapery in more and more catalogs and larger Retailers like Restoration Hardware and Ethan Allen which may have added to its spike in popularity. Linen has been used for drapery for literally thousands of years. In fact, linen drapes have been found in the tombs of ancient Egyptian Pharaohs. Linen hold some pretty stubborn wrinkles. Over time, when used as custom drapery, the wrinkles will relax but you may want to use a steamer to expedite the process. We use great care in folding, packing and shipping our drapery to minimize the wrinkles before our Clients receive them. For the most part, linen is a natural fabric and is prone to fading over time. Especially when exposed to direct sunlight. 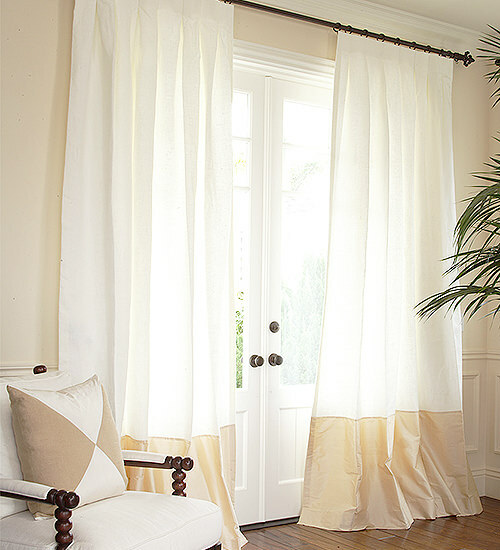 Be sure to use a very high-quality lining to protect your custom linen drapes from fading prematurely. At DrapeStyle we offer a wide variety of Linen Drapery to choose from. If you are concerned about wrinkles you may want to consider our Manhattan Linen Collection which features a blended linen and poly fabric. The Poly component helps with the colorfastness, reduces fading and reduces wrinkles. Plus, our Manhattan Linens are a great value. If you need any assistance in selecting the perfect custom linen drapery for your home, please call one of our Designers who can walk you through all of the options available. Wait Until You See This…. We just completed a Project in Southern California. 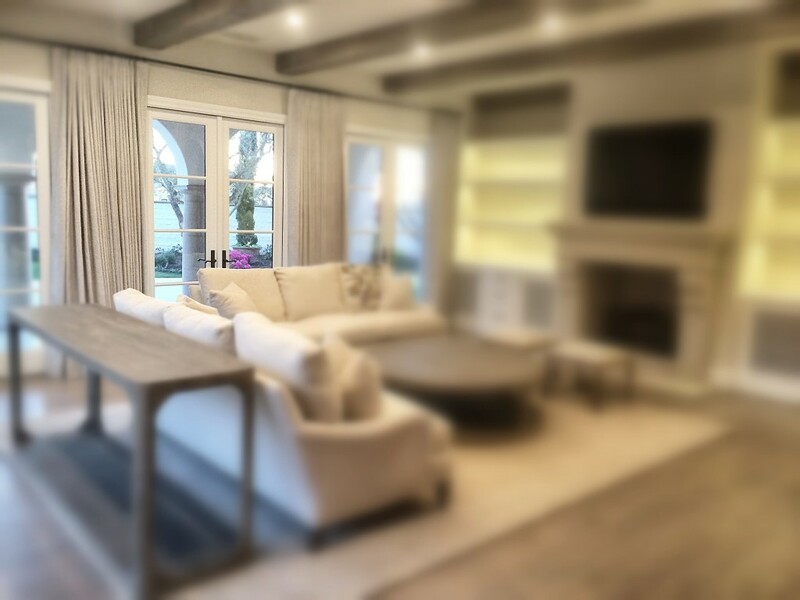 The photoshoot is next week and all of the custom drapes that went into this 10,000 square foot custom home came out of our new Arizona Workroom. Simply said, they are going to knock your socks off! Here is just a little teaser of what to expect but the “real” photos are coming from one of Southern California’s best Architectural Photographers and, although I am admittedly biased, the drapes steel the show! We dressed eight rooms of this amazing brand new Spanish Colonial and a variety of linens and sheers. We mixed Roman Shades with Drapery for depth and texture and added a extra helping of Schumacher, Robert Allen and our own line of Bristol Linen that you are not going to find at Restoration Hardware! Stand by for the full photo shoot images coming in the next couple of weeks! Stay tuned for the full photoshoot! 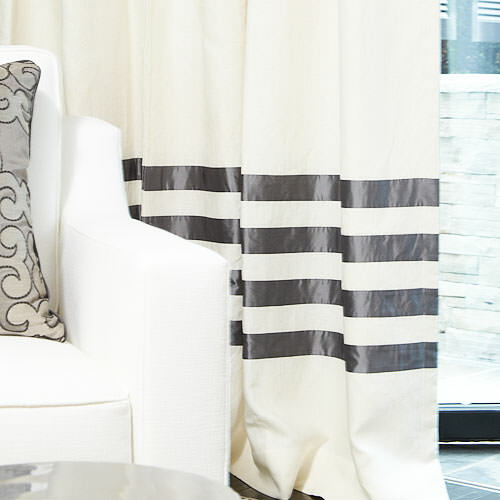 We are offering some of the best values on custom made curtains and drapes in our history! And, for a limited time you can save an extra $25 instantly when you sign-up for DrapeStyle Rewards. Whether you are looking for traditional elegance of solid silk drapery or summer casual linen you really can’t find a better time to get the world-class quality from DrapeStyle at amazing prices! Even if you have considered purchasing ready-made draperies from Restoration Hardware, Horchow, Macy’s or Ethan Allen you really need to call one of our Designers. Our new state-of-the-art manufacturing facility allows us to deliver the finest quality custom drapes at simply the best value anywhere in the US or Canada. Solid Silk Dupioni Custom Drapes – 87 Inches Long, 54 Inches Wide in a Inverted Pleat with Blackout Lining – Regular Priced at $737 per panel now just $553! Remember these panels are custom made and are available in any pleat style including French Pleat, Cartridge Pleat, Inverted Pleat, Parisian Pleat and two Grommet options! Thinking of Linen? How about our most luxurious Bristol Linen in your choice of length, pleat, width and lining option at 20% off our normal pricing. Custom Made, Designer Quality at simply incredible pricing. Need some help in choosing the right fabric, pleat or size, just call one of our Designers for assistance. But hurry, these values won’t last for long! We are so excited to be settled into our new facility in Phoenix, Arizona. Our new location and state-of-the-art manufacturing facility will allow us to manufacturer our custom drapery and roman shades faster than ever while maintaining all of the DrapeStyle quality our Clients expect. The new facility has tripled the size of our drapery workroom. Now that we have all of the extra room and extra equipment we have also been able to add additional Seamstresses to help speed production. Our move to Phoenix is a great example of DrapeStyle’s ongoing commitment to manufacturer and sell the highest quality custom drapery you can buy, all made by talented People right here in America. Thank you for all of your support and we look forward to serving you for many years to come!